Once upon a time there was a family who lived in the woods. They were the Buehler family. Herr Buehler was a woodsman, and he worked hard from sunup until sundown cutting down trees in the thick forest and then lovingly and painstakingly fashioning the lumber into beautiful pieces of furniture for the village people to buy. Frau Buehler liked to be at home, and she kept busy baking bread for her family and knitting wool mittens and socks to sell, to help keep broth and bread on the table. Herr Buehler was responsible for keeping meat on the table – sometimes while working in the woods he would shoot a large buck and thank God for the provision to feed his family. The Buehlers had three sons: Wilhelm, Dietmar and Jakob. Frau Buehler taught her sons how to read, and when winter came to the forest many nights found the family sitting in front of the blazing hearth reading books aloud, including the Good Book. Wilhelm grew into a tall young man, married a village girl and they started a family of their own in a city three days’ journey from their home in the woods. Dietmar loved music and had spent many hours yodeling to the sky as he did his chores and dreamed of singing in the Munich opera. Young Jakob had a tender heart and loved to stay close to his mother’s apron as she baked and knitted and read aloud. Jakob also loved animals and happily tended the Buehlers’ two sheep, milk cow and dog, whom he considered his dearest friends. He often confided in them after his brothers had grown up and moved away. Years passed, and all the sons grew up and lived their own lives away from the cottage in the woods. Herr and Frau Buehler were content, but lonesome for their children. They did see their young men and their families once or twice a year, but they both longed for the days when things had been simpler and all five of them had lived under one roof. No longer vigorous and spry, the Buehlers spent quiet times reading by the fire, lifting their sons in prayer before the Author of the Good Book, and watching the life and beauty of the woods outside their windows. Herr Buehler spent less time in the woods and began whittling to keep Frau Buehler company as she knitted. Frau Buehler began to see that the worries of the world were pressing down upon her beloved children, and her times of knitting were often spent talking to the Author of the Good Book, asking for His help and blessing on her sons. Sometimes she could feel the weight of the oppression on her children so deeply she would sit by the parlor window, looking out on the snowy woods, and weep for her sons. Jakob, in particular, was on Frau Buehler’s heart. Jakob had experienced deep pain and disappointment in his young life and the guardedness and suspicion Frau Buehler saw on his face deeply troubled her soul. Jakob had been a sensitive and trusting little boy, but now the big city and the snares of the enemy had changed him. He had a dark and sad look to his eyes, and he often moved and spoke as if all hope had departed from him. Sometimes at night as Herr Buehler snored under the coverlet beside her, Frau Buehler would look out of the window from her down-filled pillow, and count the stars. She was reminded how immense the Maker of those stars must be in order to hold them in the palm of His hand, and when she would cry out to Him, her heart would be calmed. But sometimes peace and calm wouldn’t come to Frau Buehler’s soul. She didn’t understand why this was. She would sit by the parlor window and knit. She and Herr Buehler would look deep into each others’ eyes and know what the other was thinking. She could almost hear her dear husband say through that gaze, “Ahh, mein Greta, look to your Maker – He will help you to know that all will be well. The One who spoke and named the stars also made our sons.” She took comfort from her husband’s strength. Day after day Frau Buehler knitted away, tending to her home, baking their bread, mending their clothes, writing letters to her sons, happily chasing her grandbabies when they came for their occasional visits. Day after day she would look out of her parlor window at the trees outside, at the snowy ground or the soft green needle-packed floor of the forest, and she would watch. Many birds came, as they always did, but never a cardinal. Orioles, chickadees, and sparrows came. Wrens, juncos, and even crows. Herr Buehler enjoyed the birds himself, and would sit at the close of a day and whittle as Frau Buehler’s knitting needles clicked and the fire crackled. Frau Buehler had told no one of her prayer to the Creator for a cardinal. Not even her good husband. A few months later Frau Buehler turned from the stove after stirring the soup and her eye caught movement outside the parlor window. There was her dear husband again, this time hanging another bird-feeder in the lower branches of a massive pine next to the tree from which the first feeder still hung. Two bird-feeders now, and Frau Buehler still hadn’t told anyone of her unusual request to the Creator. When Herr Buehler came inside, stomping the snow from his boots, she asked him “Peter, why have you hung another bird-feeder outside our parlor window?” Herr Buehler shrugged and answered, “I so enjoy these little feathered creatures, Greta”. And that was that. It is not certain how much time passed, but it was a good long time. Perhaps it was even years. Day after day many varieties of birds visited those two bird-feeders outside the parlor window of the Buehler cottage in the Black Forest of Bavaria. Blue, black, brown, yellow, orange, and grey birds. But so far never a red bird. One morning when the sun was not completely up and the light from the sky was still a deep periwinkle, Frau Buehler got out of bed and went to the window, still in her nightdress. She sighed and lowered herself into her chair, and a tiny flash of red caught her eye. As she gazed out of the window with her knitting in her lap, she saw him. A bright, cheerful, red cardinal, all alone, perched on one of the bird-feeders, cocking his head this way and that. Frau Buehler didn’t know whether to laugh or cry, or fall down on her knees. She kept very still, and watched the cardinal, the first cardinal ever to come to their woods, much less to their home. Mr. Cardinal lightly dropped to the ground and ate some of the fallen seed there. He bounced along, sampling the black seeds Herr Buehler had faithfully placed there for years, not knowing he was being moved upon by the Author of the Good Book and the Creator of all life to do so. The little bird then flew to the low branches of another tree, and seemed to watch Frau Buehler as she sat very still in the parlor window. He was in full view for about five minutes, and then with one look over his little bird shoulder he chirped his friendly cardinal song and flew off into the forest. Frau Buehler sat still in her rocking chair for quite some time, hands motionless on her yarn and needles. 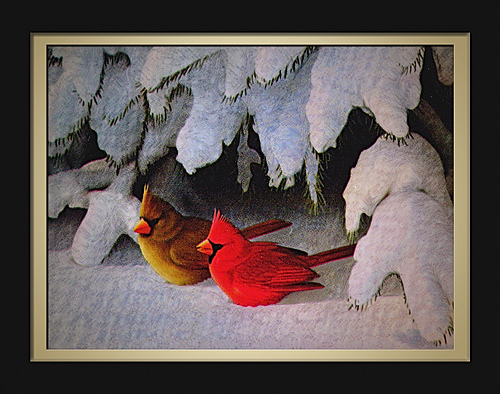 Tears rolled down her cheeks as she thanked the Good Father for the gift of the cardinal, and pondered what a kind and compassionate God He must be to cause a little red bird to fly from unknown parts of the forest to her parlor window, just to encourage her heart and give her hope. She thought of Jakob, and somehow knew that this gift from the Good Father didn’t necessarily mean that all of Jakob’s troubles would be over in a moment, but Frau Buehler felt calmly reassured that the Lord of Life would keep His strong, tender, reliable right hand on her son, to draw him to Himself and bring him through whatever would come in the future. When she heard the bed creak and knew her dear husband would soon be joining her for their morning coffee at the window, she prepared her words for the story she would tell Peter about the prayer she had prayed, and the cardinal that was the answer to that prayer. She knew her tender-hearted husband would cry when he heard it, not because he too had been filled with care and tossed by worry, but because he trusted the Good Father and was always overwhelmed and thankful when he witnessed others learning to trust Him too. What a terrific story and now I know why you love your red cardinals. Clara is beautiful and obviously very talented. Thanks for sharing and teaching us that our faith in the Good Father is the most important part of our lives. Yeah, got me the first time I heard it, then reading it, the tears flow…GOD IS GOOD! I almost felt as if I were reading a beautifully illustrated children’s book. Have you ever thought of sending this to a press that publishes children’s books. It might have to be shortened and simplified a bit … it reminds me a bit of the The Quilt Maker’s Gift. Do you know it? It is my very favorite children’s book. Actually it is a book for adults too. I have given it to all my grandchildren and thought I’d kept one for myself but I must have given that away as well. http://www.quiltmakersgift.com/ I’m not sure who the publisher is. Thank you for reading and for your comments, Beryl. Yes, I love that book you mentioned, and you’ve reminded me that my copy is missing! Time to order for the younger grandkids who have never heard Grandma read it to them. Thank you! I found your blog just at a time when I was worried and upset with one of my own sons. This is a beautiful story. Reading it brought tears to my eyes as I could connect it with my own situation. It feels like a reminder from God to put my trust in Him with my own children. Now, this story has a special meaning to me too. Although this is late, I thank you for sharing this beautiful story. May God bless you!